Substance abuse like alcohol drinking, cigarette smoking, tobacco addiction, dependence on drug, etc. are all touted to be mood-altering things which can cause a pleasurable response in users. This momentary happiness instigates a person to cling onto it and soon this becomes an addiction. Excessive and continued use of these substances causes major health hazards to a person using it. These substances have psycho-active effects on a person and even the World Health Organization confirms that substance abuse, smoking and alcohol consumption are major factors responsible for deaths. Though studies show that minor doses of alcohol are beneficial for health, no study shows that minor smoking has the same effect on human beings. If a person smokes, he/she stands at a risk of contracting numerous health hazards. Smoking a cigarette results in narrowing of arteries; this in turn restricts full force of blood to be carried out throughout the body. Heart muscles work hard to pump out blood which puts pressure on the same and this results in a person having a sudden heart attack or stroke. Apart from this, smoking also causes long-term illnesses like terminal illnesses. 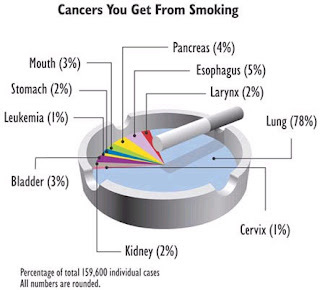 Cancer of the lungs, liver, throat, mouth and bladder are caused by smoking. Smoking also has the potential to cause infertility in men and cervical cancer in women. Since smoking narrows your arteries, it is considered to be one of the major reasons for you being a smoker developing impotence. Not only active smoking, even passive smoking has been considered as a major factor behind causing health complications in smokers. Smokers often complain that family members drive them crazy asking them to quit smoking. There is a reason behind this prodding - if you quit smoking, you can lead a healthier and longer life. Your skin and hair will be safe from any further damage that can be brought over by smoking tobacco. Smoking also kills your sensory nerves, so if you quit this habit your senses will be restored and you can end up tasting your food in a better way. Bad breath and stained teeth are other resultant aspects of smoking. So if you quit this habit, you are also giving yourself a chance to present yourself in a better way. Kicking the habit of smoking also saves you a lot of money and understandably there are many good points to it. Counselling from doctors, family members and friends can help you quit smoking. There are also certain medications like Champix tablets which can help you curb the urge for a smoke. These tablets help a person quit smoking within two weeks though the whole treatment would last for 12 weeks. Varenicline is the active ingredient in Champix which reduces the urge to reach out for a smoke and does not allow you to experience withdrawal symptoms which are usually associated when smoking is given up. Basically this substance acts against nicotine. While you are on Champix tablets, even if you feel like smoking, you will not enjoy the feeling as varenicline binds to the nicotine receptors in your brain. Champix tablets have been clinically proven to help you quit smoking. This in turn is also reduces the risk of you developing cardiovascular disease and even cancer in the future.